What are the changes to the parking lot and traffic flow? The main entrance, located by Wendy’s, will now be an entrance only. 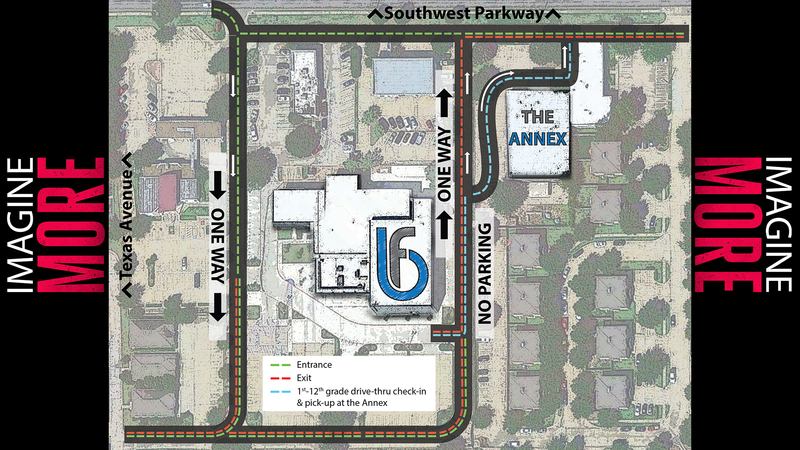 Also, the road between the Main Building and the Annex will now be a one way road providing an exit as well as access to the Annex. You will no longer be able park along the fence beside the Main Building. What changes are coming to Brazos Kids and Brazos Youth? Starting July 2nd, 1st through 3rd grade students will be meeting at The Annex during all three services. All 4th-12th grade service times will remain the same: 4th & 5th during all three services, 6th-8th during the 11:30 service and 9th-12th during the 10:00 service. Where do I need to check-in my kids? Nursery through Kindergarten will check-in at the Main Building. 1st-5th grade will check-in at the Annex, a parent must accompany 1st-5th grade children to the Annex. 6th-12th grade students will not be required to check-in. How does the drive-thru check-in work at the Annex? Volunteers will provide curbside check-in. Check-in kiosks are also available in the lobby; however, if you would like to walk your child in, you must park at the Main Building. Will the quality of my child’s learning environment be the same? Yes- the Annex has been redesigned to create separate classrooms so we can continue to provide safe environments and age-appropriate lessons. Can my middle school or high school child pick up a sibling? No- for safety and security, children must be picked up by an individual 18 years or older.